In a large bowl, mix together the flour, sugar, yeast, cinnamon, and salt. In a separate bowl, whisk together the milk, butter, egg, and vanilla. Combine the wet and dry ingredients, whisking until smooth. (The dough will be thick, wet, and sticky). Cover the bowl with plastic wrap and let the batter rest at room temperature for 1 hour. Preheat the oven to 350º F. Remove the plastic wrap and stir in the baking powder and cinnamon chips. 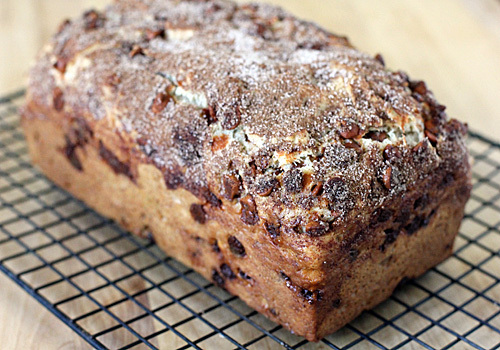 Spoon the batter into a greased 8 1/2 x 4 1/2-inch loaf pan. In a small bowl, combine the sugar and cinnamon. Sprinkle cinnamon sugar over the batter. Bake for 35-45 minutes, or until a toothpick inserted into the center comes out clean. Remove the loaf from the oven and let rest in the pan for 5 minutes. Remove the loaf from the pan and transfer it to a wire rack to cool completely. Do not slice the bread while it is hot, it will slice much better when it is completely cool. Enjoy! What a beautiful loaf! I especially love that last picture with the little pockets, yum! 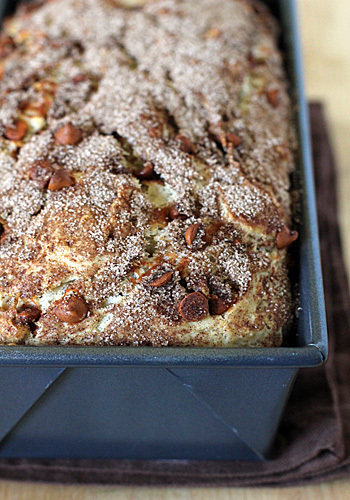 I am so ready for fall recipes like this. I just discovered cinnamon chips last year, but haven't done much with them. This looks wonderful. It must smell amazing while it's baking. Ok first I wanted to say that I LOVE your blog. Cooked a few of your recipes and they've quickly become some of our favs-esp that pork w/ blackberry sauce. LOOOOVE it!! Now I live in Spain. And we do not get cinnamon chips here. Nor can we even order them online...any idea of what I could replace cinnamon chips with? This bread looks amazing!!! They claim to ship internationally, but with a warm weather warning. I suppose that is why you are having difficulty with shipping because they would have to be "cool" shipped and that cost a pretty penny. I will keep thinking. 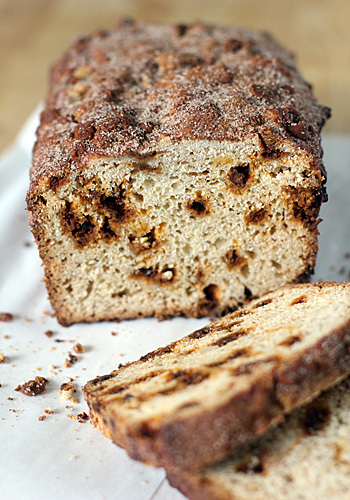 A love child of cinnamon bread and coffee cake? COUNT ME IN!! This looks wonderful. I can almost smell it! Wish you were here to have a slice (or two) :) Best! There are few more comforting spices than cinnamon :) This is just a beautiful recipe Nicole, I would DEFINITELY love this toasted n buttered as you suggested, sounds delish!